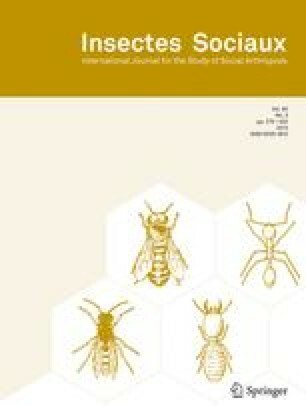 This paper is the report of a long-duration study of the production of gynes and males in Melipona stingless bees in Trinidad and Tobago, including a behavioural study of laying workers. In 167 brood samples (16342 pupae) of M. favosa, taken from 78 colonies in the natural environment over the years 1993-2001, workers represented 78.4% and males represented 17.3%. Gynes represented 5.1% of all female brood. Gyne proportion never exceeded 22.5%. Gynes were found to be common throughout the year. Like the gynes, males were present all year, but their occurrence varied over the months. Males were most common in the months of July and August. At the colony level male occurrence in the brood was characterized by very high values (maximum 74.2%), next to a frequent complete absence (in 26.5% of all samples). The finding of bout-like production of males at the colony level is supported by the observations on reproductive worker behaviour. The colonies appeared to be in different phases of male production. When male producing laying workers were present, they competed heavily for egg-laying opportunities. Various behaviours of laying workers and the queen are described and interpreted on the basis of reproductive competition and kin conflict theories. From these results, we conclude that in M. favosa, workers have a distinct influence on reproduction, including the production of gynes and males. Key words: Male production, gyne production, worker behaviour, stingless bees. Received 12 September 2001; revised 15 July 2002; accepted 21 August 2002.